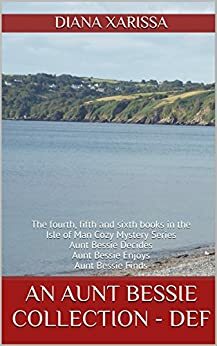 Together in one bargain-priced collection - books 4, 5, and 6 in the Isle of Man Cozy Mystery Series! Aunt Bessie Decides that she and her closest friends should have an enjoyable night out. Elizabeth Cubbon (known to almost everyone as Aunt Bessie) has made many friends over the lifetime that she’s lived in the village of Laxey, but few have been as close as the ones she’s made recently. Bessie relied on Doona Moore, Hugh Watterson and John Rockwell to help her through several recent murder investigations she’s found herself caught up in. Now she wants to treat them all to an open-air performance of a Shakespearean play on the grounds of historic Peel Castle. Aunt Bessie decides that it doesn’t much matter what show the troupe is performing as long as she and her friends can relax and have fun. Two members have recently left the theatre company. Now the troupe has thrown aside its usual repertoire in favour of a play written by one of their own. When those two former members appear in the audience, though, someone decides to get rid of one of them for good. Aunt Bessie decides to give the show another chance, but a second performance almost ends in a second tragedy. With all of the suspects blaming one another, and several of them turning up on the doorstep of Bessie’s cottage, it’s time for Bessie to decide to solve this murder herself. Aunt Bessie Enjoys planning for a pleasurable Tynwald Day celebration with her friends. Elizabeth Cubbon is called “Aunt Bessie” by nearly everyone in the small village of Laxey that she calls home. A number of murders have thrown her normally quiet life into turmoil and at her age (just don’t ask her exactly what age that is), she feels like she’s had enough. Aunt Bessie enjoys getting through the whole day without anyone stumbling over a dead body. It’s her friend John Rockwell’s first Tynwald Day and Bessie is delighted when she, Doona, Hugh and Grace get to share the spectacle and festivities of the Manx National Day with him, without anything going wrong. Aunt Bessie enjoys a quiet breakfast at home, until the police come pounding on her door. 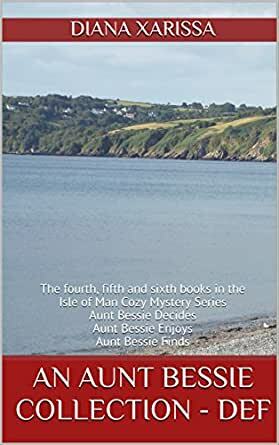 It seems someone at Tynwald Day had murder on his or her mind after all, and suddenly Bessie finds herself caught up in the most complicated murder investigation she’s ever had the misfortune to experience. This time Rockwell is doing his best to keep her as far away from the investigation as he can and Doona seems to be trying to keep Bessie under constant surveillance. If there’s one thing Bessie definitely doesn’t enjoy, it’s someone getting away with murder. Aunt Bessie Finds herself in need of a change of scenery. Bessie Cubbon, Laxey Village’s “Aunt Bessie,” is feeling overwhelmed by the twists and turns her life has taken recently. When a friend suggests that she look at a flat in Douglas, Bessie is seriously tempted to try relocating to the Island’s beautiful capital city. Aunt Bessie finds another body. This one is still breathing at least, but no one seems to know anything about the man. Could he be tied to the strange things that are happening in Bessie’s friend’s building? Aunt Bessie finds that doing a friend a favour isn’t as easy as it appears. Moving to Douglas turns out to be the easy part. Figuring out what’s going on in the building on Seaside Terrace is far more complicated. With John and Hugh both on their summer holidays and Doona working hard in Laxey, Bessie finds herself calling on other acquaintances for help this time around. The question is, can she trust them the way she knows she can rely on her friends from Laxey? Really enjoyed all the books featuring Aunt Bessie and the Isle of Man...wish this series would never end!!! Aunt Bessie does it again. The only thing I was a bit dissatisfied with was the loose end regarding the nameless man in the beginning. I won’t say more and spoil it for anyone who hasn’t read the book. Maybe the next book will clear it up. Regardless, I am thoroughly enjoying this series! I am very entertained with these books and I can't wait to finish the whole set.